At an estate auction, Daisy is delighted to find the perfect present for a young girl she knows—a charming dollhouse in need of restoration. But when local collector Harriet Kunes tries to strong-arm Daisy into selling it, she's in for a shocking—and deadly—surprise. "Price's novel is a nicely written murder mystery that centers on an unlikely theme: the allure of expensive, antique dollhouses...the book pays off with intriguing characters with plenty of small-town charm." "Daisy is as unconventional as her village in Millbury, Pennsylvania is quaint. The other characters are unique and lovable, and they grew on me fast. This was a fun read, and I enjoyed it immensely. Anyone who enjoys a good cozy will find themselves right at home reading A Dollhouse to Die For, but be prepared, good things do come in small packages and you may find yourself fighting the urge to go out and buy a dollhouse of your own to decorate." "What is so refreshing about this series is that it features a longtime happily married couple who realistically confront the day-to-day struggles of a partnership even when not investigating a murder. This second in the Deadly Notions series has fun exploring adult relationships as well as humorously revealing the very many forms obsessions take in everyday life." 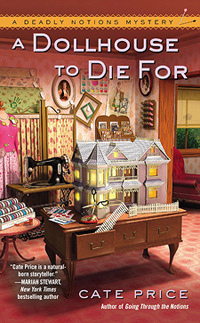 "A Dollhouse to Die For is a lively romp of a cozy, filled with so many enjoyable characters and twists and turns a plenty. Not only is the town enchanting and described beautifully, but all of the characters come to life with entertaining dialects, fun situations and true village camaraderie. The murder investigation was entertaining and intelligent. Anyone that enjoys a good mystery, with good friends and an occasional glass of wine will be truly pleased with this book." "If you are in the notion to read about notions, this is the book! Cate Price gives readers not only two murders to consider, but lots of fantastic details about collecting and working with dollhouses. A great addition to an interesting series. Daisy once again surprises me with her intuition and her ability to get down to the nitty gritty when it comes to figuring out what happened. This is an excellent story. I loved the dollhouse facts and Price certainly kept it interesting from first word to last." "In this installment of the Deadly Notions mysteries, Cate Price wove a story that kept me guessing until the end. I pride myself on being able to reach the solution before the end of the book, but I also love it when an author stumps me. It makes the story more interesting. If you like mysteries, especially those set in quaint little towns, I highly recommend this one."